Calvary is excited to recognize the Honorable Marie C. Johns at our Hope Awards Dinner on May 16th. The Hope Award is presented annually to a local leader who has shown outstanding dedication to improving the lives of women and girls. Marie’s long career exemplifies the core values that we at Calvary Women’s Services strive to achieve. For more than 30 years, Marie C. Johns has been a prominent leader in business, civic, and government service. 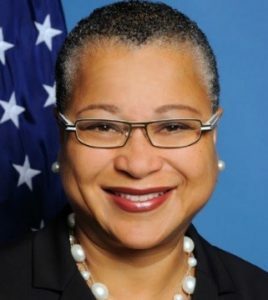 Her diverse and distinguished accomplishments include serving as Deputy Administrator of the U.S. Small Business Administration (SBA) under President Obama, membership to the Greater Washington Business Hall of Fame, and holding senior positions in the telecommunications industry such as President of Verizon Washington. Throughout her career, Mrs. Johns has worked tirelessly to provide underprivileged youth with access to education and job opportunities in the technology sector. One of her most well-known initiatives was the SEEDS program (Students Educated for Economic Development Success). Local teenagers, many of them drop outs, received technical training for jobs in the telecommunications sector through SEEDS. As a result over 200 participants were employed, and many were able to complete their requirements for a high school degree. Marie is also active with the Girl Scouts and co-chaired a $4 Million capital campaign with the Metropolitan Washington Girl Scouts Council. Marie is currently serving as Managing Member of Leftwich, LLC. She also maintains her role as Founder and President of L&L Consulting, a business development, organizational effectiveness and public policy consulting practice. In 2013 she was appointed to the advisory board of Enlightened, an award-winning, information technology (IT) consulting firm based in Washington, DC. Marie holds a Bachelor of Science and a Master of Public Administration degree from Indiana University’s School of Public and Environmental Affairs. She has been awarded an honorary doctorate of humane letters from Howard University, Trinity College (now Trinity University), and the University of the District of Columbia. We are constantly inspired by Marie’s myriad accomplishments in both the public and private sector, as well as her distinguished philanthropic efforts. Please join us this year as we enthusiastically honor Marie C. Johns and all that she has done to better the lives of women and girls in this community. Learn more about the Hope Awards Dinner and purchase tickets here.